L'ETOILE ELITE and L'ETOILE UNIVERSAL makes it possible for every woman to have the hair of her dreams by offering the best hair extension available. Extensions can give you gorgeous hair in just a few hours. Increasing volume and/or length has tremendous impact on your appearance and can create a fresh youthful look. L'ETOILE ELITE is proud to offer great extensions which have the advantage over other brands. L'ETOILE ELITE artistic team of dedicated specialists have been providing professional hair extensions since the 1980s and they are your number one choice for the best of the best in hair extensions. L'ETOILE Universal Hair Extension,which are only available at L'ETOILE ELITE. Eddie Azzi is world renowned hair stylists and image consultant. His international experience and reputation for creating new looks for women over the past 20 years have earned them the title of - beauty expert. Eddie Azzi believes our image is something we can have fun with, explore and change, become the women we want to be, and look the way we want to feel. But our image is also reflection of how we feel about ourselves within, our confidence and belief in our own beauty. 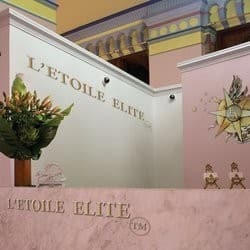 At L'ETOILE Elite, the team of experienced stylists, colourists, beauty therapists and image consultants have a commitment to revealing the best in every facet of your style, your looks and your image, and devote every skill and every moment to pampering, relaxing and recognising the beauty in you. L'ETOILE Elite is heaven to tranquillity with a verity of treatment available to fulfil your needs. From the facials to private image consultations, body treatment, massage and Full hair salon service. Eddie azzi says beauty is something we all deserve, not a gift for chosen few, a visit to L'etoile Elite hair and beauty salon will discover the beauty in you and give you an experience to remember. I asked him (Eddie) how much is it to colour my hair. I wanted a grey blond colour. At first he started with 400 dollars for hightlights, a tone and the colour. When I said that it was way too much money for me, he made an offer of 250 dollars. So 250 dollars for the hightlights, tone and colour. At the end they only thing they did was colouring the roots. So not the whole hair, no hightlights and no tone! So when I said that I'm not going to pay 250 dollar, he became really angry. "It was a special colour blond, so that's why I had to pay 250 dollar". So I got ripped off for sure and it is really ugly as well!! You can see two strokes. Yellow blond and the roots is a way different blond. So it's terrible and I paid that much for it. This is my worse hairdresser experience ever!!! Who can really cut short hair. Eddie is simply the best!!!!! I got my hair and makeup done last Saturday as a gift and I was told that my hair was too yellow and need toning. I was charged $145. for a toner that normal costs $20. I asked for a small braid down one side and instead got a braid across my hair. I am nearly 50 years old and I looked like Heidi. It was terrible. It was too late to fix it. Very disappointing don't go there, too expensive and they don't listen. Eddie makes me look fabulous! Without a doubt the best hair stylist who has looked after myself,friends & family for many years.Great staff who are specialist in the latest hair techniques to make you look wonderful ! L'Etoile Elite is definatley worth a visit.